Searching for a Watauga Lake waterfront vacation log cabin with a scenic view of the mountains and the Lake? The sounds aren’t bad either because nature and wildlife thrive around the lake. We have lots of toys to get you on the water too: Dock with Swim Ladder, canoe & 3 kayaks.There’s not a bad seat in the house when it comes to views of Watauga Lake, the cove, & mountains. Fully equipped gourmet Kitchen and a Wet Bar/Kitchenette! Dishwasher, 2 microwaves, 2 coffee makers, blender, crock pot, cooking utensils, 2 refrigerators, 2 ice makers. 3 of the 4 decks are covered and the Balcony is a wonderful place to get a great view of the lake and mountains. Sleeping arrangements: King bed in the Master Bedroom (scenic view included). Two bedrooms with queen beds. Another bedroom with two twin beds. For overflow guests, we have a queen sofa bed in the Living Room and one in the Family Room. This is one of Eastern Tennessee’s best equipped vacation rentals. Great amenities like Air Conditioning, Jacuzzi Tub, driveway that holds 4 cars, Gas Fireplace, Kitchenette/Wet Bar, Pool Table, Game Table, Home Theater System, Video Library: even an Outdoor Shower for warmer months! Guests spend many evenings gathered around the lake shore Fire Ring. They also like to use the Gas BBQ Grill on the Main Deck to show off their cooking skills. You’re surrounded by the Appalachian Mountains and the Cherokee National Forest. Welcome to Daniel Boone country! 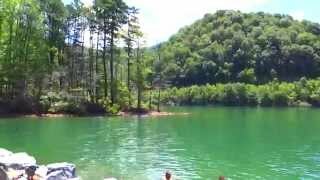 Watauga Lake is truly one of the most beautiful and pristine mountain lakes in the United States. Lake Cabin 4 You is on the lake and in the mountains so you experience both every minute you’re here. Dock your boat, or rent one from Fish Springs Marina nearby. Dinner might include Black or White Crappie, Bluegill, and Largemouth or Spotted Bass. What a special lake! 105 miles of shoreline, 15 miles long, and pristine blue-green waters are ideal for canoeing, kayaking, water skiing and power boats taking a long voyage. Boat to a hiking trail! 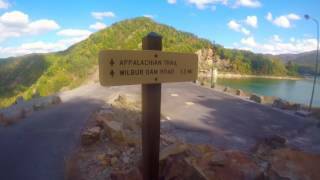 The Appalachian Trail crosses the southwestern tip of Watauga Lake. 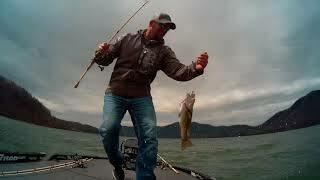 Watauga Lake is lightly touristed so finding a quiet shore to fish and explore is easy. There are plenty of other trails close by, too. If you need cabin supplies, drive 5 to 30 minutes to get anything you need. If you want to try some snow skiing, head to nearby Appalachian Ski Mountain in Boone, NC, Beech Mtn, or Sugar Mtn. There are several places for Snow Tubing, too. Since you book directly with me (Scott), I can give you tips on how to live and play like a local. Just let me know what you like to do in the inquiry form. Go Whitewater Rafting on the the Unicoi River or the New River, or find a steams edge and try Fly Fishing. All these activities are minutes from your Watauga Lake cabin! Art, shopping, bars, and restaurants are close by in Boone, Banner Elk, and Blowing Rock in NC. An authentic Thai and an Italian restaurant are minutes away. Both of these are run by natives of the respective countries. $1,575.00 to $2,625.00 / week. Nightly and monthly rates are available. Add 13.5% state and local tax. cleaning fee of $160.00 applies. Refundable damage deposit of $200.00. Small well-behaved, housebroken dogs without fleas or ticks are welcome. Pet cleaning fee is $100.00 at registration or $150.00 if discovered after arrival. Minimum Age to rent is 25 years old. My wife and I found Watauga Lake when looking for lakefront property in the southeast. We are environmental consultants and truly appreciate the water quality and lack of boat congestion. We live in Florida but travel to "Waters Edge" every chance we get. In the meantime, you can enjoy our luxurious custom cabin in the mountains!